I love a pasta salad filled with fresh, crunchy chopped vegetables, maybe some chicken and a flavorful homemade vinaigrette. But let’s be honest. 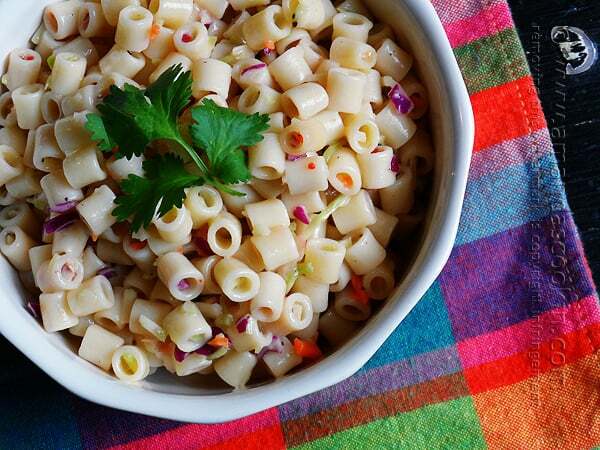 Sometimes you just need a quick pasta salad when you already have too much on your entertaining plate. After all, you are making everything and hosting a barbecue or a party, adding one more thing to the list can be daunting. 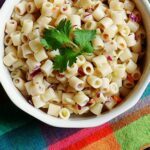 This quick pasta salad uses 3 ingredients and takes almost no time to throw together so you can focus on the main dish and hanging with your friends and family. Seriously, I cannot wait to start sitting outside again. This has been a brutal, snow-filled winter. At least we can finally see the ground again. The lake is still frozen though. I can’t wait to start seeing sunsets like this again [these photos are from my Instagram account]. I took this picture last fall but it feels like forever-ago. And this. I want to see this again. Even though much of the snow is gone now, it’ll be a couple more months before we can really enjoy the lush green you see at this farm just down the street from me. My cats hang by the windows a lot. This shot is Rex peering out my office window watching the birds. Just seeing leaves on the trees again will be a blessing! And of course, country roads. Warm breezes, the smell of country air (which not everyone knows how to appreciate haha) and picturesque views on my everyday routes. I can’t wait for them to return! So until then, I’ll be gearing up some recipes to use this summer. it’ll be time to clean the grill soon and start enjoying the warmer outdoors again. This pasta salad is a starter but it’s a great way to throw something together and get on with the rest of your menu. Make it first, put it in the fridge and it’ll be good and chilled by the time you’re ready to serve it. Here’s what you need. 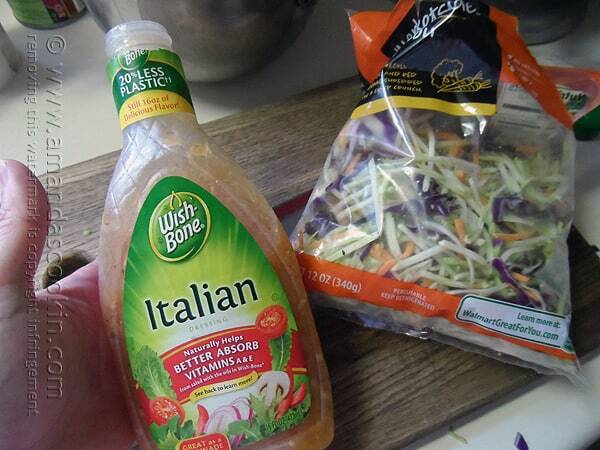 A salad dressing you like, some pasta and a bag of broccoli slaw. Cook the pasta, drain it and rinse it with cold water. 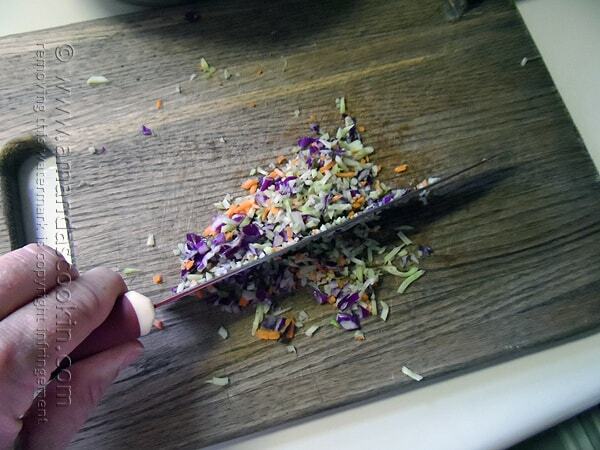 Chop up your broccoli slaw into little bits. Mix the pasta, dressing and slaw. Done. Looking for something a little more involved? I’ve hand picked a few for you below, or you can browse all the salad recipes here. Cook pasta al dente. Drain and rinse in cold water. Drizzle with salad dressing, just enough to moisten. Toss pasta with dressing. Chop broccoli slaw into small pieces and toss into the pasta. Drizzle more dressing (to taste), cover with plastic wrap and refrigerate. 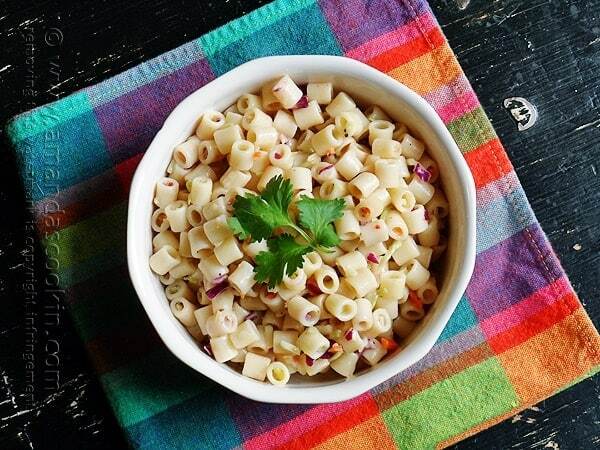 Test pasta salad by stirring after a few hours of chilling. If more dressing is needed, add it and return to the refrigerator until ready to serve.